It's been a while since I had a great time reading a book. Lately I keep starting a book but I was too lazy to finish it (book slump is worse) but then I saw Karmic Hearts and it suddenly catch my attention and I was like "I want to read this book!" 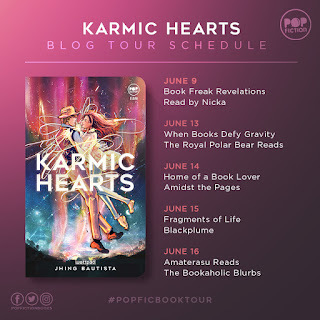 I got lucky to be part of this book tour and since it is my first time reading a PopFiction book, I don't know what should I expect. I was excited and nervous at the same time. Karmic Hearts is the kind of book that I would love to re-read again. I really enjoyed reading it to the point where I had a hard time putting the book down so I needed to find a place where I can finish it without anyone bothering me. I end up in PaperMoon at SM Mall of Asia, I ordered coffee and I knew it was the perfect moment to finish that beautiful book. Anyways, back to my review, I enjoyed each characters so much. Cupid and Mina are a perfect match, their chemistry was impossible to ignore. I loved Cupid from the beginning he's charming and funny meanwhile Mina is the serious type but full of curiosity. Without them? I'm not sure how will my review end up. LOL. I loved the flow of the story, it was an easy read and it has a little flash backs from their past lives. The book was a bit predictable since Cupid mentioned about the love of his life, but aside from that, I don't think people will guess what will really happen because it has a bit of twists and turns too. The ending was heartbreaking and happy ending. Well I thought at first it will be heartbreaking, but I'm glad for the twists. I do have a question though, will there be a part two of the book? Or a Cupid side story at least? I am hoping there is one because this book deserves a series. 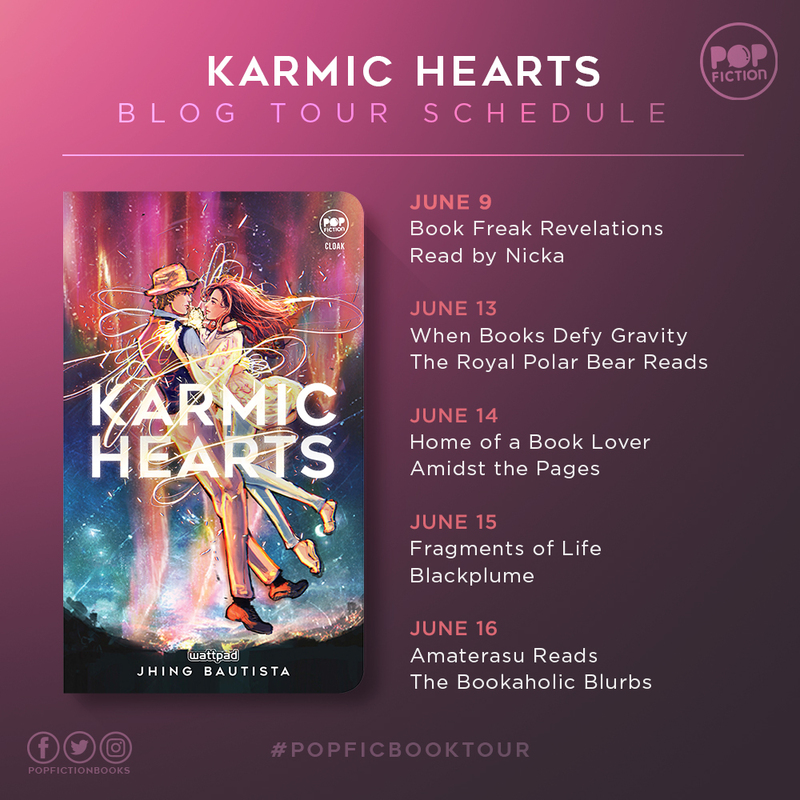 Karmic Heart is beautiful, not just the cover but the content as well. It caused mixed emotions to me as a reader. (PS. I hugged the book after reading it I just loved it so much!). Lastly, thank you to the publisher for giving me a chance to be part of this tour. It was a great honor. Staring into his eyes was like looking into the galaxy— wide and deep. It was like I was being sucked in, inviting me to discover all of him. If he was cute from a few feet away, he was breathtaking up close. I breathed, then saw him smile. His dimples deepened. There was a mixture of mischief and maturity in his eyes. I couldn’t explain it. “You’re too close,” I told him, taking a step back. I felt a little relieved. What’s happening? Before he looked indifferent, now he looks like he wants to kiss me. Is that even okay? “You’re practically screaming them,” he said. He bit his lower lip to stifle a laugh. Look who’s amused, trying to stifle a laugh at my expense. But then again my cheeks are probably red from all the blushing. “Like a ripe tomato,” he teased. I didn’t answer. He knew I couldn’t do it. First of all, how would I even hold him without hurting him again? With a deep frown and much hesitation, I did what he told me. I placed my hand on his and at that very moment, the gold ribbon lifted itself and wrapped around my hand. It bound our hands together, but our skins weren’t touching. The bow in his hand was becoming longer as it circled us. I was able to place my hand on his shoulder, as he placed his hand on my waist. He gently swayed as he hummed. I was careful not to step on him, careful not to have my hand slip on his arm. We were touching, all right, but it wasn’t the kind of touch that I wanted. Not skin to skin. We were still restrained, but I knew it was the closest we could be. So close, but not close enough. I couldn’t help but feel sad. It was wrong. The feelings were wrong. They were leading to nowhere. Why did it hurt? It wasn’t supposed to. I didn’t know him that well to be this attached. He caressed my face. I couldn’t feel the warmth of his touch, but I felt the ribbon. “T-This is wrong,” I told him. I leaned away and added, “You’re in love with her.” I didn’t want whatever I was feeling for him to get stronger.